How Rare Is A Porsche 911 SC? For quite some time the Porsche 911 SC had been the most affordable option in a 911. That is no longer the case with the 996 now taking its place and early 997 values are also falling quickly. Prices of all air-cooled Porsches have risen over the past few years. The cost for an example in good condition will set you back about $28,400 with excellent examples run about $44,200. Top of the line concours quality SCs go for about $62,000. For many years if you wanted an affordable Porsche with a flat-six engine a 911 SC was your best bet. However, air-cooled Porsche’s have started to get out of reach for many and the SC is no different. Because of the rise in air-cooled cars from the German performance car maker, the early mid and rear engined water cooler cars have become very affordable. The most attainable of these is the 986 generation Porsche Boxster. 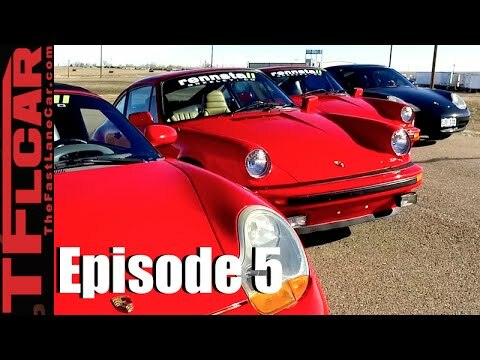 What Is Faster On The Track A Porsche 911 SC, 930, 996 or 986 Boxster? Most Porsche enthusiasts would give up their left thumb for a chance to drive a 911 SC, 930, 996 and 986 Boxster back to back on the track. The folks over at Fast Lane Cars got an opportunity to do just that as they compared two of the cheapest Porsches on the market today with two classic cars that have a much higher market value. The 986 and 996 have the advantage of newer technology when compared to their 80’s siblings. The 911 SC and 930 are iconic cars that take you back to a time when driving was an analog experience. The older cars are also lighter packages with a much sought after air-cooled power plant.